Too many clicks to get to the scores of your favorites. 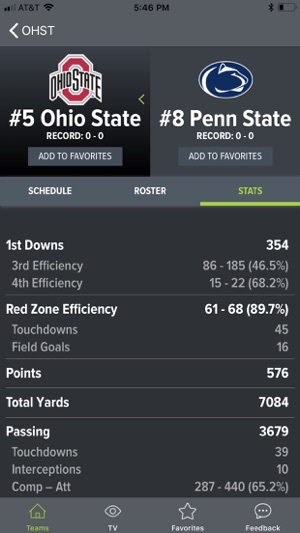 The overall scoreboard (called TV in the app) is not any different than yahoo or msn or any other site. So there really isn’t a reason to have it. 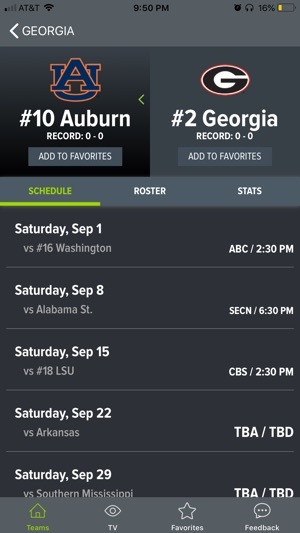 If you want an app you can just click on to give scores of all the games it is pretty simple. If you want any stats this isn’t the place either. Very basic and not even by player. I have it a two instead of a one simply because it isn’t cluttered with ads trying to make me look at other stuff. What I should be able to do on the app is set my favorites, tap that button and get scores on all of those. That’s not the case though. 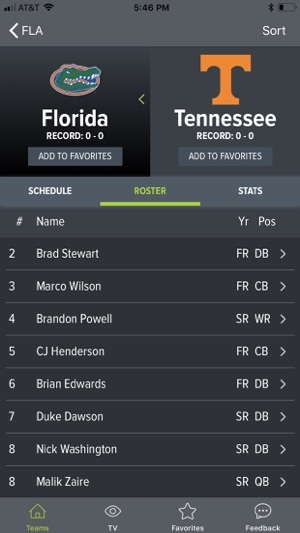 You can set your favorites from the "Favorites" screen or by tapping the "Star" on any team. 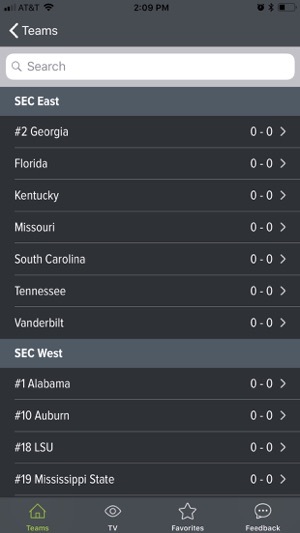 On the "TV" page, select the Conference filter, then "Favorites", Top 25 or any conference. 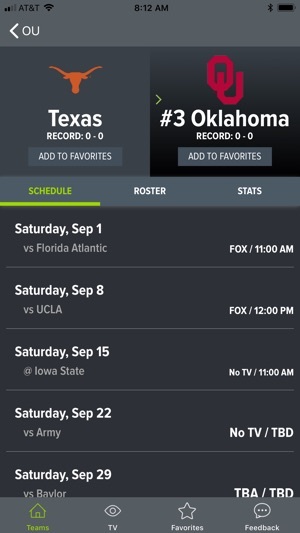 This will show you scores, times, channels for your favorite teams. Click into any game for "game mode". 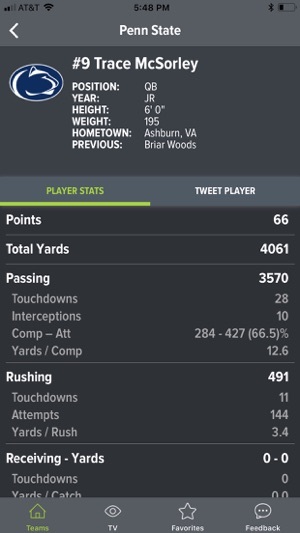 You can click any player and get access to their cumulative stats, similar to a game-day program. You can see team stats by clicking "Stats" for the selected team. You can quickly switch between the teams you are watching by tapping the desired team in the game header view. This allows you to switch between the rosters of the teams you are watching very quickly. If you like, send us an email through the "Feedback" page and we will send over some YouTube videos that outline how to optimize your setup. I think the key here is to utilize the "Conference" filter on the TV page to see your favorites. I hope this helps and feel free to drop us an email. We do appreciate the feedback! This is a great resource for those "who just did that?!" Questions that come up a million times during a college football season. The app responds quickly and is easy to use. I spot checked a few items, and it appears to be very accurate. 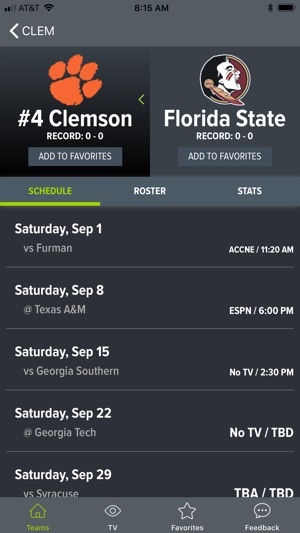 I'm a college football nut and this app is what I've been searching for a long time. 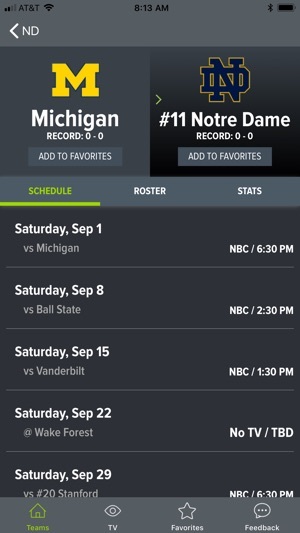 Love the rosters and absolutely love the TV schedule. 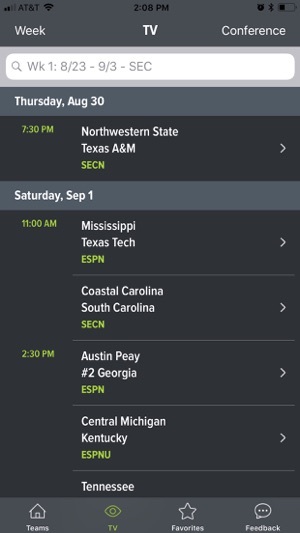 No longer have to look at my cable guide to look at my game schedule during College Gameday. This is awesome for watching a game in person with roster list. Love this app ! Better than ESPN! 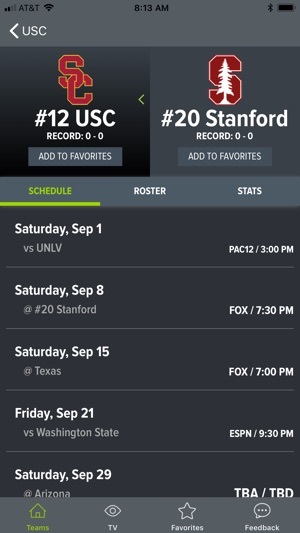 Better than CBS Sports app. THE BEST!